Or, at least I used to hate writing. When I was much younger, I was always interested in Math and Science. I read some normal books, but I was the kid who checked out science books from the school library. Anytime I had to actually write something in school though, it was pure torture for me. I felt like I was OK at it, but hated doing it. As time went on though I found myself writing more, like 30 page lab reports in college, and eventually as an officer in the Army I had to write frequently. As a Company Commander I found myself writing counseling statements, award recommendations, and memos for all kinds of things. The one I’m most proud of is my command philosophy, a memo officers traditionally publish to their soldiers when they first take command of a unit. I’ll find a copy and post it. The point is that as I have aged, I have found myself doing more and more writing but it never occurred to me that it might be fun to write just because I wanted to. Aside from the blogs I had been reading, another motivator for me was that I knew a few people who have published books. Check out my friend Rose Bush who has two fiction books that are getting good reviews on Amazon. Rose is a friend of mine from the Army, as is another author, Rick Rouzer. Rick published a book called Fortunate Son about his experience in Iraq as the commander of unit from American Samoa. While writing is not their main source of income, they are ordinary people who have published at least one book. Maybe I’ll write a book someday, but for now I’ll stick with just trying to keep up on my blog. I’m enjoying it, but having trouble making writing a priority. After all, my blog was supposed to be about decluttering, which is something I’ve actually been doing a lot of lately. Enough about writing, I’m going to give Jeff’s challenge a go. 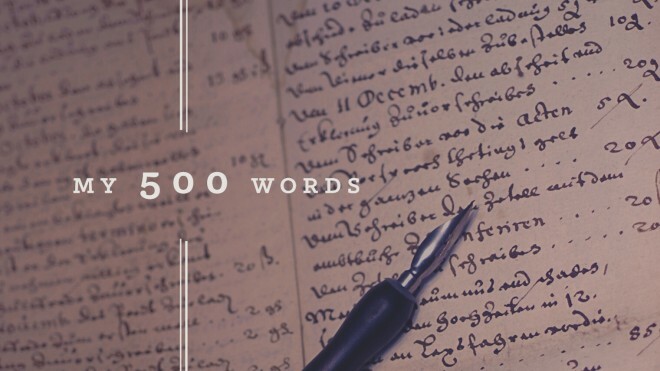 Here’s a banner linking to his post about the 500 words challenge. Check it out. Everyone that has a blog and is joining the challenge has a link to their site. There is a long list (over 2500 last time I checked) so take a look at some of those blogs as well. Thanks and feel free to subscribe and/or leave a comment.